We run to remember those who were killed. We run to honor the survivors and first responders. We run to never forget. And we run to ensure the future of the Oklahoma City National Memorial & Museum. 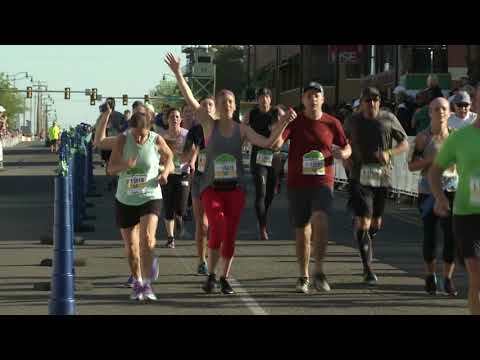 The Oklahoma City Memorial Marathon is about more than running. Our mission is to celebrate life, reach for the future, honor the memories of those who were killed and unite the world in hope. This is not just another marathon. It is a Run to Remember. The Marathon is not only the largest race in Oklahoma, but is the largest fundraiser for the Oklahoma City National Memorial & Museum. The Memorial does not receive annual operating funds from any local, state or federal government, but rely solely on the support of friends like you to help us maintain and preserve the Memorial and Museum year-round. Today, we encourage you to join us in our fundraising efforts and become Tied to Our Mission. When you raise or give $10 or more, you become Tied to Our Mission and will receive 2019 commemorative shoe laces. You do not have to be a registered runner to be Tied to Our Mission. Anyone can participate to help us reach our $30,000 fundraising goal. Thank you for being Tied to Our Mission! Please spread the word on social media and let others know about the Marathon and that you are Tied to Our Mission. And remember to follow us @okcMarathon and use #RUNtoREMEMBER!